Concealed carry vs open carry, that is the question. I know this is going to stir a lot of debate. There are advocates on both sides of the issue. Many open carriers feel it is important to express their rights. I will state at the beginning of this, I don’t say either way is better, you just have to know what you are getting yourself into. With open carry, you have to realize you are going to attract attention, sometimes really bad attention. You will get questions, might get hassled by the police and you might even make yourself a target. 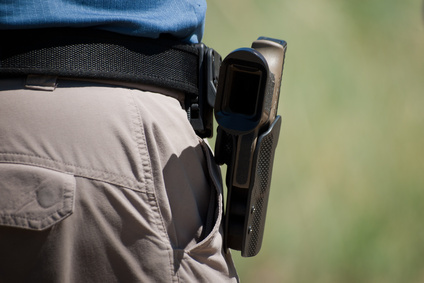 With open carry, you have to have a very heightened sense of awareness about where you are and who is around you. Someone might go for your gun. You will want to distance yourself from others. In addition to firearms training, you will want some grappling training to be able to get away from someone. If there is a threat event, they will probably target you first. You have to be aware, quick, and accurate. Now on the plus side, you will have a smooth draw for your weapon. You shouldn’t have to worry about clothing getting in the way, unless it is cold and you have a jacket on. Also you might be eligible for a a concealed carry license due to where you live or something in your background. Open carry might be your only option. Probably the biggest drawback of concealed carry is concealing the weapon. This might restrict the size and caliber of what you carry. Weapons can and will chafe and rub holes in your skin if you don’t have a good holster for them. Another thing to think about with concealed carry is what you need to do and say when the weapon is exposed, especially with law enforcement. Be deadly serious about this, way too many people get shot in these circumstances. Check out the post on the subject. The greatest advantage in my mind with concealed carry is the surprise you might have on a threat. They will not be expecting an armed response and may have let their guards down. Whatever carry method you go with, you have to train with it and stick to the method. The idea is to establish muscle memory so that you don’t have to even think about what you are doing, just react. One note for beginners, when you start out it is going to feel unnatural. That is because you haven’t done it before. Get an instructor to learn new techniques and stick with them until they feel natural. Check out this great video that further explains the pluses and minuses of open carry and concealed carry. Leave us a comment about which one you prefer and why.